VMware Enterprise Licensing Agreement. Simplify management. Reduce costs. Increase impact. Simplify management. Reduce costs. Increase impact. The VMware ELA is a complex agreement to manage – especially as the tempo of contract updates and new product release cycles increases. With so much change, it is difficult to know what will affect your business and how. Frequent product and program updates across Network, Data Center, Cloud and Edge technologies make it hard to understand what will affect your licensing and how. Understanding entitlements and new programs to optimize licensing requires time and expert knowledge many organizations do not have. Lack of tools and resources to maintain visibility across your cloud and on premise licensing increases costs and licensing compliance risk. Receive guidance and proactive reviews to maintain compliance, take advantage of special offers and prepare for new products and services. Gain consistent visibility into on-premise and cloud licensing through ongoing assessments and reviews. Coupled with expert guidance, you will identify potential gaps as well as options to reduce compliance risk and overspending. Keep updated of your licensing entitlements through quarterly contract reviews. Get expert guidance on new program options to maximize the impact of your budget and technology. Ever wondered how much licensing complexity is costing your business? Let's look at Tom, a VMware customer who manages his licenses individually. Because each of Tom’s multiple VMware licenses has its own contract, terms and conditions, and expiry date, he spends up to 50% of his time managing licenses... Time he could spend managing his actual infrastructure and focusing on valuable IT projects. From cutting costs to simplifying IT, there are a lot of reasons to consider the VMware ELA. Unfortunately, with a $250,000 minimum spend on net new assets and highly-customized terms, understanding, if the VMware ELA is right for you, is challenging. What if you could unify dozens of licensing agreements into a single, flexible contract? How much time would that save you? Would it help your organization be more strategic? 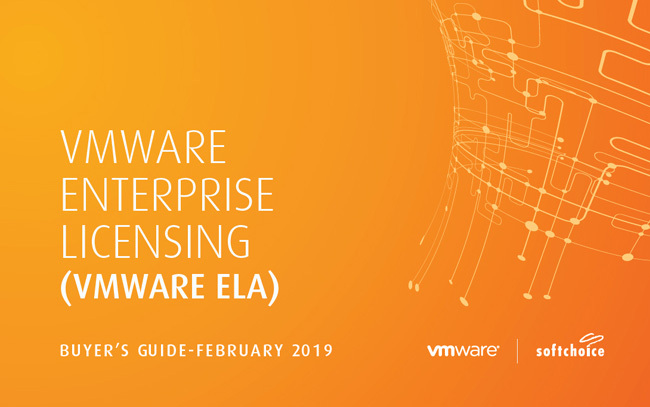 Check out our on-demand webinar on the VMware enterprise licensing agreement (ELA). Whether you already have an ELA, or want help transforming your IT and slashing costs with VMware, this webinar is for you. Optimizing software investments isn’t exactly the most exciting topic for IT or the business. But that’s not to say it isn’t an important one. From cutting costs to enabling your biggest, most ambitious digital transformations, picking the right licensing model is an important step.